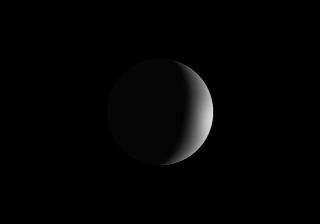 At 2 p.m. EST on Friday December 6, Venus will be shining at its brightest. Look for it in the southwestern sky just after sunset. Venus is shining at its brightest in the low southwestern night sky just after sunset, making it a fine time for stargazers to observe the brilliant planet, weather permitting. Venus' dazzling brightness is the result of some cosmic geometry. As the planet moves around the sun, observers on Earth can see it illuminated from all angles. This causes Venus to pass through "phases" similar to the moon. When Venus is at "greatest elongation," farthest from the sun in our sky, as it was on November 1, we see it as a "half Venus." When the passes between Earth and the sun, as it will on Jan. 11, called "inferior conjunction," it is illuminated from behind, just like the new moon. The brightness we see from Venus depends on two things: its phase and the planet's distance from Earth. Venus should be brightest at its "full" phase, like the moon, but at that time it is at its furthest from us. At "half" phase, as it was on Nov. 1, only half of the planet is illuminated, but it is much brighter because it is much closer. As Venus nears inferior conjunction, its illuminated portion shrinks down to a narrow sliver. This causes it to fade in brightness. But it is also getting closer to us, which makes it brighten. This NASA graphic shows how bright Venus is as compared to other objects in the night sky. This week, these two factors balance out, and we will see Venus at its very brightest. It is neither "half Venus" (50 percent illuminated, 25 arc seconds in diameter) or "new Venus" (0-percent illuminated, 60 arc seconds in diameter), but somewhere in between. In fact it is 26-percent illuminated and 41 arc seconds in diameter. This is the "Goldilocks point" when distance and phase combine to produce the greatest brightness. This week Venus will shine with a brightness of –4.9 magnitude, on the upside-down brightness scale that astronomers use. It is based on the brightest stars being magnitude 1 and the faintest stars visible being magnitude 6. Thus the brighter the object, the smaller its magnitude number. Astronomers extended this scale into the negative for really bright objects. Sirius, the brightest star in the night sky, is a magnitude –1.4 star. The full moon, meanwhile, is a magnitude –12.7 and the sun is –26.8. So Venus will be considerably brighter than Sirius this week, but nowhere near as bright as the moon. It is bright enough to cast shadows, when observed on a moonless night from a dark location. Even though Venus is the brightest object in the night sky other than the moon, surprisingly few people have seen it in its current apparition. That's because at this time of year the ecliptic, the path of the planets across the sky, makes a very shallow angle with the horizon in the northern hemisphere. Although Venus is very bright, it is also very low in the sky, so is often blocked by clouds or buildings. Editor's note: If you have an amazing photo of Venus or any other night sky object that you'd like to share for a possible story or image gallery, please contact managing editor Tariq Malik at spacephotos@space.com.